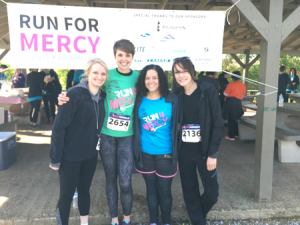 Nashville’s Run for Mercy celebrated another successful year as hundreds gathered at Shelby Bottoms Park on Saturday, April 2nd. Beautiful spring weather made for great race conditions for the families, individuals, and businesses who participated in the 5K and Family Walk to support Mercy Multiplied. Upon arrival to the event, participants enjoyed checking out booths set up by sponsors and businesses, including Chick-fil-A, Jamba Juice, Krispy Kreme and TribEndurance Bars. Kids enjoyed playing on the inflatables that were set up in the Kids Corner. Before the race, 2011 Mercy graduate Heather shared her story of transformation with the crowd. Heather had battled an eating disorder for eight years before she attended Mercy. She also struggled with over-exercising, alcohol abuse, and depression. With Mercy’s help she was able to break free from these issues and find complete healing and restoration through Christ. She is now married and has a successful career at Ramsey Solutions in Brentwood, Tennessee. Janice Gaines sang the national anthem to kick off the race. The top male overall runner was Josh Hayes, finishing with a time of 18:35. The top female overall runner was Ashley Casavant with a time of 18:38. Prizes were awarded to the top runners in each age category and to the top fundraisers. Mercy supporters Ken and Lisa Abraham led the top fundraising team “Got Mercy?” and Julie Palmire was recognized as the top overall individual fundraiser. Jeff Seagrove won this year’s social media contest for posting photos on Instagram and Twitter during the race. All proceeds raised through the sponsorships, registration fees, and donations go toward helping broken and hurting young women find freedom for their lives. Mercy Multiplied would like to thank the race planning committee and volunteers, as well as the generous sponsors who made Run for Mercy Nashville possible, including The Dave Ramsey Family Foundation, who was the presenting sponsor for the race. If you were unable to participate in the 2016 Nashville Run for Mercy but would still like to support the cause, please click here to donate.